Choosing a holiday destination to suit your whole family can be tricky. If you’re traveling with young children for the first time, you might want to start with a short flight to keep things as stress-free as possible. Before you travel to Europe make sure that your EHIC card is up to date and visit https://www.europeanhealthinsurancecard.org.uk/ to renew it. This will ensure that you, and your family are covered against any expected medical costs. 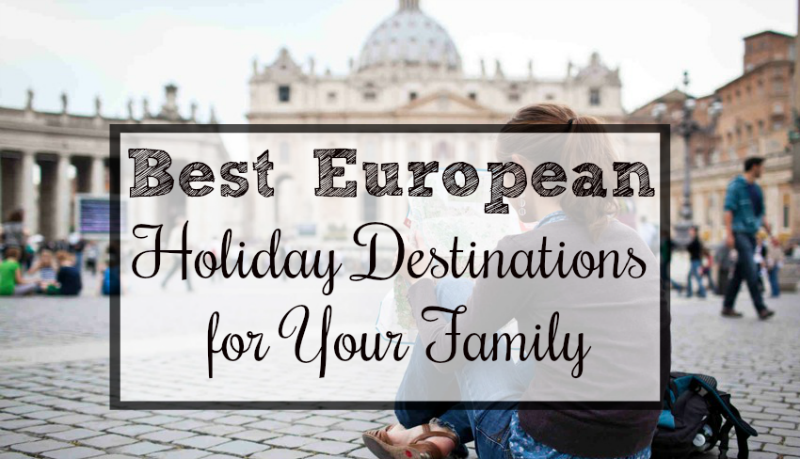 If you need inspiration for your family holiday, here are some of the best destinations for families in Europe. Algarve has become a bit of a hotspot for British tourists over the past few years. However, this doesn’t mean that it is entirely built up and overpopulated. Travelers with families can have the best of both worlds if they choose to stay in less well-known towns, such as Salema. If you’re staying in Salema you can take advantage of easy access to family-friendly facilities close to the beautiful beaches but still experience some of Portugal’s culture. Salema is home the traditional whitewashed houses you’d expect to find in Portugal and a long stretch of sandy beach. If you’re looking for an adventure holiday, look no further than Brittany. There are plenty of affordable campsites which are suitable for families of all ages. There are a number of campsites, which run different organized expeditions. These are perfect if you’re looking to keep your kids entertained for the whole week and often include activities like den building, creating campfires and spotting wildlife. Brittany has plenty of campsites, which provide everything you need for a fun-packed family holiday, from playgrounds to easy access beaches. Majorca is known for being a luxurious destination, but that doesn’t mean you can’t take your family with you. The Spanish island has a number of family-friendly beaches, which are manned by lifeguards and there are plenty of alternative things to do if you get bored with the beach. Majorca has some great cycling and walking routes with incredible views along the coast. You can also drive from village to village and soak up the laid-back way of life. You won’t need to worry when you eat out in Majorca, as large family meals are common in Spain. This means that most restaurants will be friendly and accommodating to you and your children. Croatia is an up-and-coming holiday destination; it’s been made popular by people looking for an affordable European holiday. You won’t find sandy beaches in Dubrovnik but there are plenty of rocky coves to explore. If you’re a more adventurous family, there is a wide range of water sports to try, including kayaking and snorkeling. Alternatively, head over to Copacabana beach for inflatables, banana boat rides and water slides! The city itself is historic and beautiful, so if you’re looking to add some educational value to your family holiday it’s ideal. Dubrovnik also makes a great base for boat trips around to other nearby islands. Moving to a new state might be common for some people, especially if that’s the nature of your job. However, for others, they have lived most of their lives in the same state, and moving seems unsettling. This is but a normal phase that anyone will experience even if you’ve already settled down and know your neighborhood by heart. However, you don’t have anything to worry about since moving entails a new adventure, something you can look forward to, particularly if you’re moving to Los Angeles County. Los Angeles County is definitely big-city living. It’s known for a lot of things, including warm, sunny weather, being rich in culture, and the entertainment and fashion scene. 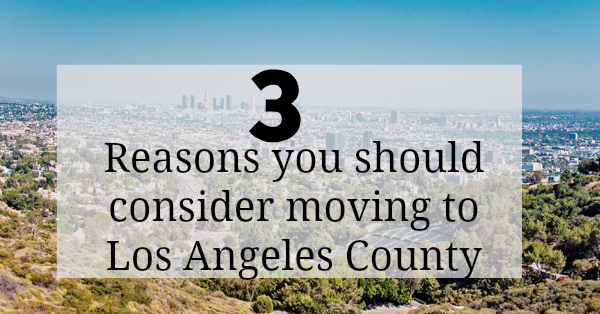 If you’re thinking of moving to Los Angeles Country but haven’t yet finalized your decision, here are three reasons you should already be out and packing your stuff. The warm and sunny weather that this place has is one of the things that make it appealing to a lot of people. It gives you more freedom to go outside and explore, do outdoor activities, and practice healthy living. You can explore more beaches, mountain ranges, hiking trails, and even has nightlife thanks to the warm days and cool nights that this place offers. The weather is also a contributory factor to the natural beauty that you can find all over the area. You’ll always have a reason to go out whether to enjoy nature or to satisfy your taste buds. The food scene is what sticks to most people when you talk about Los Angeles County. You can take your pick from the many high-end restaurants, mid-priced to cheap establishments, and even gourmet food trucks. You can also enjoy fresh produce from the farmer’s market that is open seven days a week. If you are looking for a particular cuisine, you can find this at certain neighborhoods that serve as the focal point for various groups and cultures. And when you’re in LA County, you can enjoy a variety of sushi and burger flavors. There is no doubt that LA is among the most ethnically and culturally diverse cities in the world. This diversity is what makes the city rich in culture, food, and even architecture. And the people who live and work here come from all over the world. So you’ll definitely be exposed to different people who come from various walks of life with their own religion, beliefs, language, background, and social status. You can even find neighborhoods that are home to certain cultural groups. The diversity also opens up many job opportunities for a lot of people. Los Angeles County is definitely a lot of things. People may have come and gone from this place and some have stayed and called it home. But those who leave come back for what the city has to offer. With diversity present everywhere you look; you won’t feel out of place. So come on down and experience the great weather and the diversity of life in Los Angeles County. The summer holidays are looked forward to all year long. It is a time for your whole family to relax and enjoy themselves together, while exploring somewhere new. Safety isn’t the first thing people think of when they think about holidays but it is important. If you are visiting Europe, keep your whole family covered with an EHIC card. This means that if you need emergency medical treatment while you’re away you’ll be able to access it at a reduced cost. Protection from the sun is important no matter how old you are. Children will need help putting sun cream on. Make sure you use a high factor and top-up sun cream throughout the day. The general rule is to apply it fifteen minutes before you go out. If sun cream says it is water resistant, that doesn’t mean that it’s waterproof. Sun cream needs to be reapplied every time your children go in the sea or pool. Keeping out of the sun in the hottest parts of the day, from midday to around three in the afternoon, is a good idea. For babies, or very young children, you will need a tent to provide shelter all day as their skin is much more sensitive. 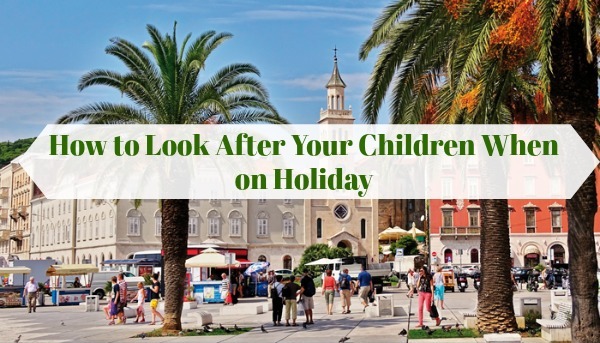 Being on holiday is exciting for everyone and children are prone to going off to explore. Children will need to be supervised just as intensely, if not more carefully, as you would when they are at home. Never leave your children unattended by water, as the risk of drowning is high. Make sure your children know not to wander off and where to go if they do get separated from you. Dress them in bright colored clothes to help you to identify them from a long way away. Don’t leave your children unattended at any point throughout the day, there will always be family friendly restaurants available or dedicated crèche services at your hotel. You can never be too prepared. Bringing a basic first-aid kit with you is essential. Bring plasters, insect repellent, anti-septic cream and a thermometer as a minimum. All the medicine you use on a weekly basis should be packaged up and brought with you too. Prescription medicines usually have to be labeled. Make sure you check the rules and regulations of taking medicine on the plane before you travel. Make sure your holiday home, apartment or hotel room is secure when you arrive. Each night be sure to lock the windows and doors. This is especially important if your children are sleeping in their own bedroom. If you notice anything that doesn’t look right, such as a faulty latch on a window, report it to the property owner. Other safety measures to take include removing any cleaning products and putting them somewhere out of reach of your children’s inquisitive hands. It sounds over cautious but there is nothing wrong with being careful! If you have wanted to see Niagara Falls in person for years, and are planning a trip to the region with your family, it’s important to have an itinerary that covers more options than just seeing this magnificent natural phenomenon. While the falls themselves are amazing, and attract millions of visitors every year, when you have kids with you, you also need to have other activities on your list to choose from. Read on for a selection of family-friendly destinations you can consider checking out when you arrive. No matter the ages of your children, once you have checked into your chosen Niagara Falls hotel, you should head to the Niagara Freefall and Interactive Center for some play time. 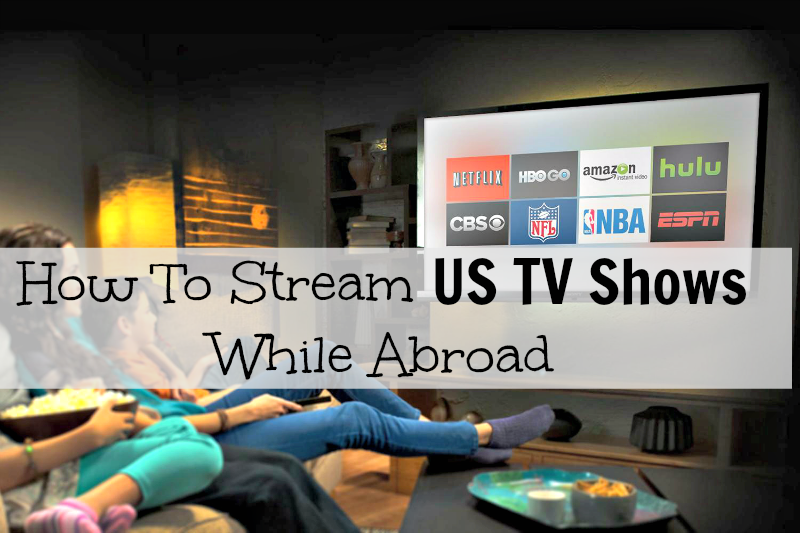 Here you will find something to interest everyone; and it is a perfect choice when the weather isn’t so great. At the Center, for starters your family can get a feel for the thrill of skydiving, without the risk. Indoor skydiving is possible for children 7 years and older, and for groups of up to four people at a time. The activity is completed within a wind tunnel flight chamber, and has users flying at air speeds approaching 140mph. If that’s not enough, at the Freefall and Interactive Center you can also let the kids go nuts with tokens for the many interactive arcade games on-site, or have some family time playing Lazerball. This game is paint-free and mess-free, and uses soft, reusable foam balls rather than paint. The Center also offers a mechanical bull ride and a 32-foot high rooftop rock wall for climbers of many abilities. A great educational outing for your family when you’re in the Niagara region is Old Fort Niagara, on the U.S. side of the falls. Perfect for history buffs and novices alike, the Fort, which was built in the 1700s, is the oldest operational one of its type in the country. It was used primarily during the French, Revolutionary, and Indian Wars, and over the years has been owned and used by the Native American, French, British and American troops. If possible, try to schedule your visit to Old Fort Niagara with the attraction’s special event periods. You and your kids will have the opportunity to meet some on-site re-enactors who recreate the lives of past garrison members for visitors. At other times of year, you can watch hourly musket demonstrations, and examine the site’s well-preserved cannons, barracks, rooms, and other exhibits. 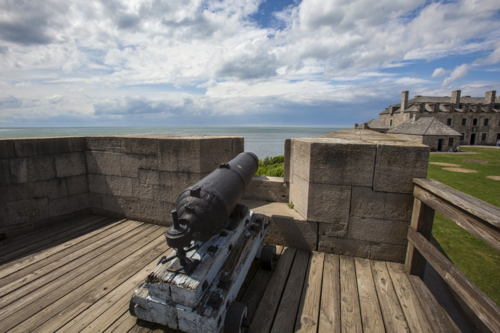 While at the Fort, you can also enjoy self-guided audio tours, and take in the scenic view of the falls, plus Lake Ontario and the Niagara River, from the Fort’s high vantage point. If you are looking for something to please teenagers, or children over 7 who don’t scare easily, then put a visit to the Nightmares Fear Factory on your itinerary. This not-for-the-faint-hearted experience has been operating for more than 30 years, and is located inside a classic-style haunted house found at the top of Clifton Hill in Canada. Participants in the Fear Factory are challenged to “survive” as they walk through the attraction in groups of up to six. This is done at your own speed, as you are led through the house by a trail of red lights – pretty much the only illumination in the attraction. At this memorable destination, you will be scared at many points along the way, plus you’ll find that changes are made regularly so you can visit often. If, however, the family chickens out and can’t quite complete the experience, there is no need to feel deflated. Nightmares Fear Factory actually boasts about the fact that more than 140,000 people have chickened out at some point along the way since the haunted house opened! 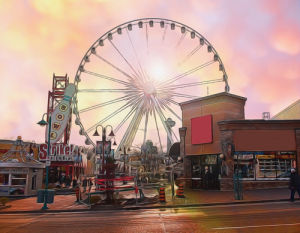 Another top attraction in the Niagara region that is suitable for all ages is the Niagara SkyWheel, on the Canadian side of the falls in Clifton Hill. This approximately 15-minute experience takes passengers 175-feet high, and is the largest observation wheel in Canada. Ride the SkyWheel and you will enjoy a beautiful birds-eye view of Niagara Falls and the surrounding area and, if you visit around dusk or later, you can also take in the Falls Illumination show when the water lights up in the colors of the rainbow, and the city skyline sparkles. Each SkyWheel journey includes at least four rotations on the Ferris wheel, and families can ride together in their own gondola. If you’re a keen photographer, you’ll surely love the opportunity provided by the SkyWheel too. When up in the air you can take snaps of the falls from a new angle that captures both the Horseshoe and American Falls at one time; plus you can get to see for miles in every direction.